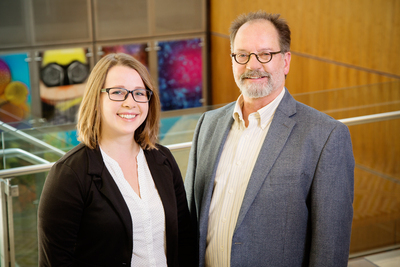 University of Illinois nutritional sciences professor Rex Gaskins, graduate student Patricia Wolf and their colleagues found differences in the microbes that live in the lining of the colon of African-Americans versus non-Hispanic whites in the U.S. These differences are linked to the risk of colon cancer in African-Americans. CHAMPAIGN, Ill. — A new study reveals that African-Americans have measurable differences in the number and type of bacteria that live in the colon – and those differences are related to their higher-than-average colon cancer risk. The study, reported in the journal Gut, looked at colonic tissue biopsies from 197 African-Americans and 132 non-Hispanic whites collected over a two-year period ending in 2012. The researchers amplified microbial DNA from the samples, then looked at the abundance of various types of microbes. The study found that African-Americans have more sulfide-producing bacteria in their colon than non-Hispanic whites in the U.S. do. Although these microbes are a normal part of the gut ecosystem, an overabundance of sulfide in the colon can lead to inflammation and can damage DNA, said University of Illinois animal sciences professor Rex Gaskins, who led the new research with Nathan Ellis, who was at the University of Illinois at Chicago at the time of the study. Ellis is the scientific director of the Cancer Biology Research Program at the University of Arizona Cancer Center in Tucson. “We found that African-Americans have an increased abundance of bacteria that make hydrogen sulfide, which we demonstrated more than a decade ago to be a potent genotoxin,” Gaskins said. The study also revealed that Bilophila wadsworthia, a bacterium that produces hydrogen sulfide from the amino acid taurine, was significantly more abundant in African-Americans with colon cancer than in their healthy counterparts. “These bacteria are using nutrients associated with an animal-based diet,” Gaskins said. The relationship between B. wadsworthia abundance and colon cancer risk did not hold true for non-Hispanic whites, however. Most cases of colorectal cancer – about 85 to 90 percent – are sporadic, rather than familial, Gaskins said. There may be a genetic element, but environmental factors like exposure to pollutants or dietary components also are required to spur the onset of cancer. African-Americans have significantly higher incidence of colon cancer than other Americans. In 2013, there were 33.5 colon cancer cases per 100,000 African-Americans, compared with 26.8 per 100,000 whites. Explaining these disparities has not been easy. Native Africans have dramatically lower colon cancer rates than African-Americans, suggesting that environmental factors, including dietary habits, are a key to the problem, along with genetics. A 2014 study on which Gaskins was a senior co-author found that switching rural South African Zulus who normally ate a low-fat, high-fiber diet to a diet with a lot of meat and animal fat led to increases in sulfide-producing bacteria in their colon. This change took less than two weeks, the researchers found. Scientists already knew that a diet high in red meat and animal fat was associated with an increased risk of developing colon cancer, Gaskins said. Gaskins also is affiliated with the Carl R. Woese Institute for Genomic Biology. The National Cancer Institute and the American Cancer Society supported this research. To reach Rex Gaskins, call 217-244-3165; email hgaskins@illinois.edu. The paper “Race-dependent association of sulfidogenic bacteria with colorectal cancer” is available online and from the U. of I. News Bureau.